LOCKLINEA woman risking everything to save heroin addicts in the face of overwhelming odds. A story of hope that illuminates the unseen costs of war. Living in Afghanistan, we face the daily reality of the ongoing war. Under a bridge in Kabul, we found a very different struggle, one that is perhaps far more dangerous. Thousands of people huddled by the putrid Kabul River, injecting and smoking heroin. The most dangerous subject to investigate in Afghanistan is the drug trade. We knew making a documentary that had anything to do with the drug trade would be inherently risky, not only for us, but for anyone else involved in our film. Yet it wasn’t the drug war that drew us in, but rather an Afghan woman, her colorful headscarf disappearing as she slipped under the dark recesses of the bridge. Laila Haidari, “the mother of the addicts,” captivated us from the moment we met her in 2012. She challenges all stereotypes of an Afghan woman and is fascinatingly complex. Laila founded her own pioneering addiction treatment centers, using the Narcotics Anonymous (NA) approach. She now operates two shelters, one for men and another for women, which recognize the dignity of individuals struggling with addiction in Afghanistan. In the face of opposition from the Afghan government and without any funding, Laila finances her shelters through her own restaurant, the only one of its kind in the country where recovered addicts are employed as waiters. She is both a mother and a warrior, incredibly brave and yet vulnerable. We began with the plan of making a short film about Laila for Al Jazeera English’s Witness series. As we became more entrenched in the world under the bridge, we knew that a feature film would better represent this story of human struggle, tragedy and resilience. This is our time directing a feature-length documentary, but we are working with a very experienced team. We want to bring Laila at the Bridge to theaters and provide an alternate lens into Afghanistan, one that shows a world of both despair and the hope that is so often left out of the news. When we began work on this film in 2012, there were one million drug addicts in Afghanistan. As of May 2015, that figure has reached three million. Afghanistan is now not only the world’s biggest supplier of opium, but the most addicted country on earth. In the nearly three straight years that we have been filming, we also followed the journeys of several of the addicted men and women for whom Laila is fighting so hard to give a new lease on life. Though they fall many times, there is always the hope of reaching for something better. Their stories show the resiliency of the human spirit. This is a deeply intimate, observational film about a woman on a mission who will not give up, despite the odds being stacked against her. Like Laila, we are committed to helping the individuals struggling with addiction in Afghanistan by bringing their experiences to the world. We have completed filming and need your help to complete editing the film. Please help us bring Laila at the Bridge, and a different side of Afghanistan, to the world. I have worked with many young Afghans here in Denmark, and have heard of this notorious river and bridge in Kabul. Looking forward very much to seeing the film. Best of luck with the rest of the process. Congratulations on reaching your target and looking forward to seeing the film, love to you Gulistan and Zekria! Good luck. Can't wait to see it! I wish I could do more you guys! Haven't worked in several months as I've been working on my own projects too :) This film has to be made though! can't wait to see it. I wish you success in this project and all your future endeavours! I'm really looking forward to watching this documentary. People like Laila are inspiring and their stories should be known by everyone. Hoping this gets you to the funding bridge! I look forward to this! -Tom from Washington, D.C.
Can't wait to see the film! All the best to Laila and your team of filmmakers. Thank you for making this beautiful movie! I wish you every success in telling a story that so many need to be made aware of. You are both an inspirtation! Good luck with the movie. It looks amazing! Good luck! Exhited to see the movie! Good luck and best wishes to you Elisa & Gulistan! Not only truly inspiring just from the trailer, but a glimpse into the shadows of Kabul's most forgotten - and most heroic. This film must see the light of day! Good luck! Such an important film! I can't wait to see it! Thank you for bringing us your wonderful project and this great story! All the best with your campaign and the film. You have a great supporter in Ricardo! Best of luck with the project, it's going to be a great project. With Love Gordon, Helen and Wombat! For Laila - wishing her the strength to continue the great work! Thank you for this story, I can't wait to see the film! I really believe in this film, guys. Can't wait to see it. We're so excited to see Laila at the Bridge and hope it brings support to Laila and her mission! We love the filmmakers a ton and it's beyond impressive to see what they've accomplished! Beautiful trailer, heroic story! I am so proud of you, Elissa! Ricardo and fellow artists, Your film is so incredibly important on so many levels: from the personal to the political. Art - in this instance - has the power to change the world. Your tireless efforts will do this! Best of luck, sounds like an great film on an important subject - and with Ricardo Acosta editing it will be even more amazing! Best wishes from Rebecca and Bjoern!! Can't wait to see the final product! Thank you for all of your hard work. It's an important story and your work is meaningful. Wishing you good luck and success in carrying it through the home stretch. News and another address request! Hello friends of Laila at the Bridge! We hope you’ve all been well. We were thrilled to have our world premiere at CPH:DOX in Copenhagen in Marrch, where we won the F:ACT Award! You can read about the award and the jury statement here. We are getting ready for our North American premiere at Hot Docs in Toronto this month. Laila herself will be there for the screening and Q&A, so if you’re in toronto we would love to see you there! we mailed out many of the rewards, but we are still missing addresses from a number of supporters. If you haven’t received your reward, could you please email Elizabeth at elizabethmirzaei@gmail.com and we’ll get your mail out? Thank you again & shipping addresses! Once again, thank you all so very much for your incredibly generous support towards Laila at the Bridge. We are tremendously grateful and very moved to know that people from all over the world care about this story from Afghanistan and believe in the film. Thanks to you all, we have been able to get started with our editor and are excited to share updates in the near future. We could not have done this without your support. Once again, our deepest thanks to you for helping to bring Laila at the Bridge to life. You are all a part of this film and we are excited to be on this journey together. A new short clip from the film! Thanks to our wonderful supporters, we are at 37% of our goal so far. We have 20 days left to make our goal! Watch this 40-second clip showing the complexity of the drug trade in Afghanistan, and some of the causes of the world's heroin problem. 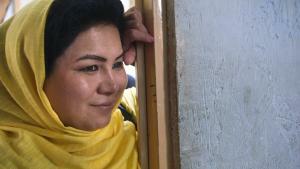 Laila at the Bridge: The Farmer from Gulistan Mirzaei on Vimeo. We have reached 10 percent of our goal! Our sincerest thanks to all our supporters so far. We are looking forward to being able to complete this film and bring it to theatres around the wold. Thank you for our first donations! We have our first seven donations for Laila at the Bridge! Thank you very much to all. We are truly appreciative. Receive exclusive access to a deleted scene from Laila at the Bridge, plus a thank you on Twitter. Receive access to an online screener of the film within a few days of the movie’s theatrical debut [DATE TBD]. In addition, you will receive everything listed above. Receive a beautiful lapis lazuli gemstone, native to Afghanistan, in either a heart pendant or a keychain. In addition, you will receive everything listed above. Receive a digital download of Laila at the Bridge upon the film's digital release. In addition, you will receive everything listed above. Receive beaded pens, handmade by several recovered addicts at Laila's shelter. In addition, you will receive everything listed above. Receive your choice of DVD or Bluray of the film upon its release, plus a jar of Afghanistan's famous saffron. In addition, you will receive everything listed above. Receive a DVD of an International Documentary Film Festival Amsterdam classic from the IDFA Cinema Delicatessen Collection. In addition, you will receive everything listed above. Receive The World Documentary DVD Box consisting of 3 IDFA documentaries, a special offer sponsored by the IDFA Bertha Fund. In addition, you will receive everything listed above. Receive an 8x10 unframed original, limited edition photograph of Afghanistan by award-winning Afghan photographer Gulbuddin Elham. In addition, you will receive everything listed above. Receive two (2) tickets to a private screening with the filmmakers in Brooklyn. In addition, you will receive everything listed above. Receive an Associate Producer credit in the main credits of the film. In addition, you will receive everything listed above. Receive a Co-Producer credit in the main credits of the film. In addition, you will receive everything listed above. Receive an Executive Producer credit in the main credits of the film. In addition, you will receive everything listed above. Receive an "In association with" credit in the opening credits of the film. In addition, you will receive everything listed above. 168 supporters have contributed to this project!